Distance : 58.4 miles (94 km) approx. 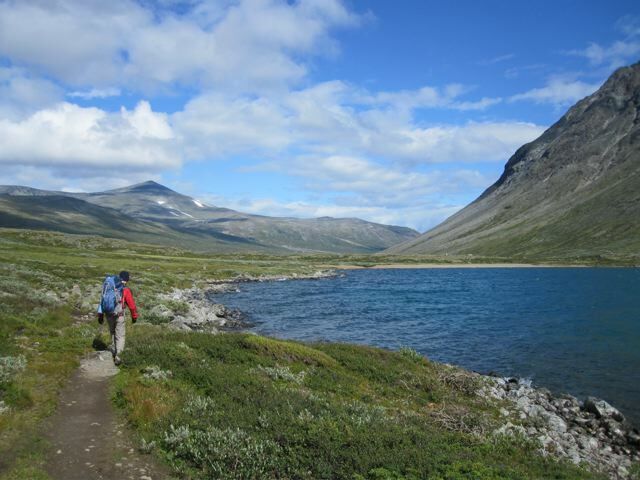 See VisitNorway.com for transport details to and from the trailheads. For current bus timetables see NOR-WAY Bussekpress. Season : Late June to early September. 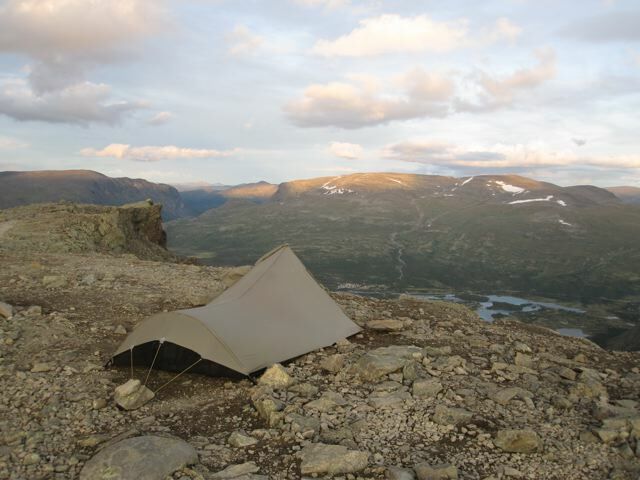 The excellent 1:100,000 Jotunheimen published by Ugland IT is all you need for navigation. It is widely available in bookshops and outdoor stores throughout Norway. Alternatively, if you are looking for even greater detail, try the 1:50,000 series Jotunheimen East & Jotunheimen West by the same publishers. 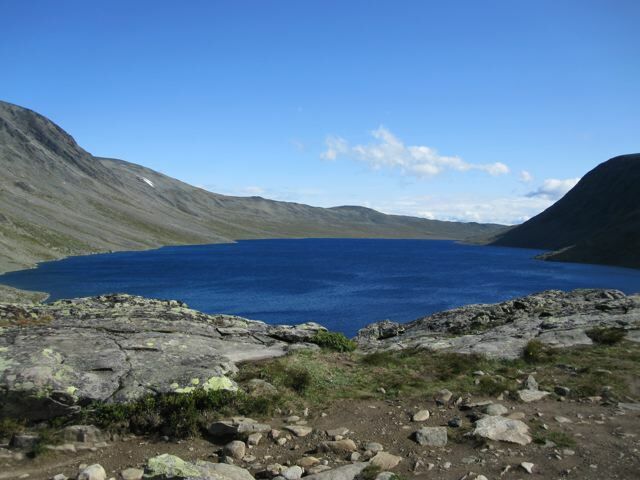 Visit Norwary.com and Lonely Planet’s Norway guidebook are good sources of general information on Jotunheimen National Park. Meals and basic supplies are available at the lodges and staffed mountain huts. As you would expect, prices are not cheap. If camping, you are better off purchasing your supplies beforehand. Be prepared for wet, cold and windy conditions. 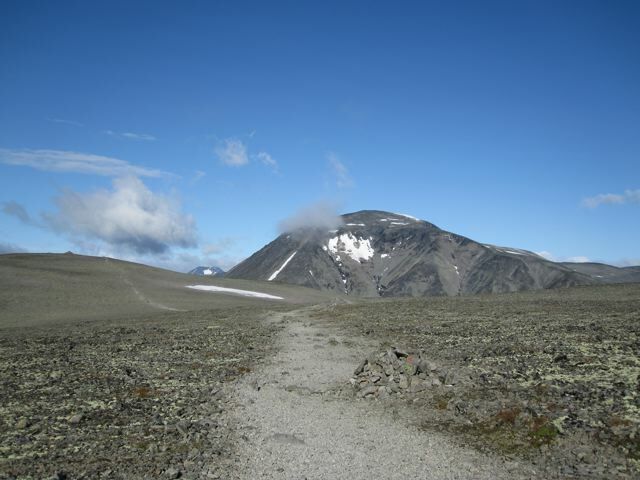 The route we took from Gjendesheim to Turtagro includes the famous Besseggen ridge. 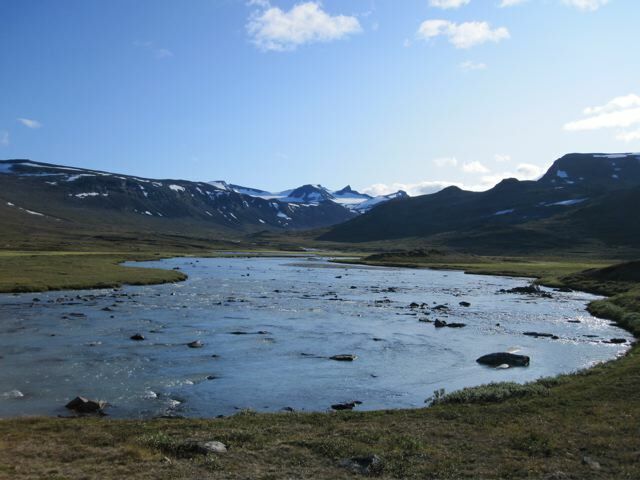 If you want to avoid the hordes, make a late start from Gjendesheim, camp up on the ridge, and then get away early the following morning. You will have the place all to yourself. The crowds thin out after Bessengen. About a kilometre before Memurubu, head north at the trail junction. Keep going north via Lake Russvalnet to eventually reach the lodge at Glitterheim (approx.17km from the trail junction). Good camping in the area around the lodge. There is a shop inside, which sells basic, but expensive supplies. 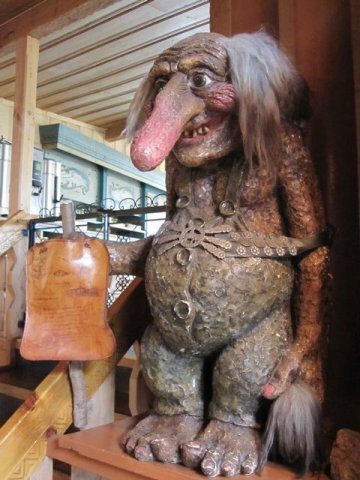 The trail is well marked between Glitterheim and Leirvassbu. 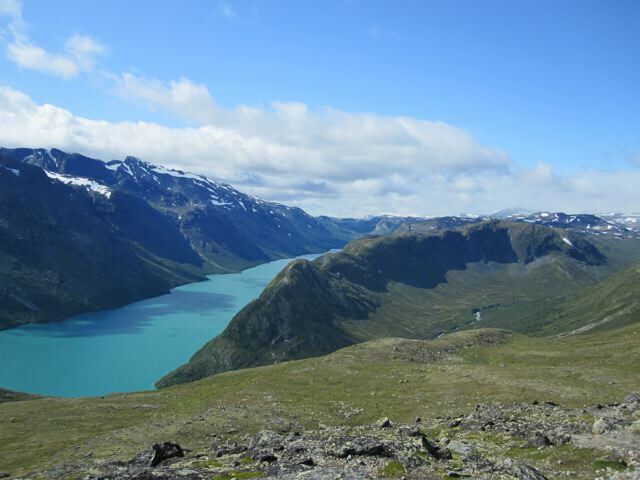 If the weather is clear, consider the side trip up Galdhopiggen, Norway’s highest peak. We gave it a miss due to heavy rain and cloud, conditions that continued for the rest of the hike. After Leirvassbu, continue SW through Gravdalen and Storutladalen. Afer 15km you reach a trail junction at a footbridge over the Utla River. 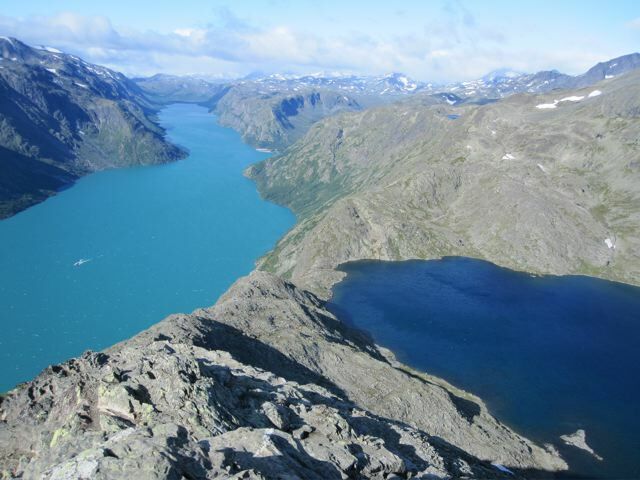 Cross the river and climb west, then NW to eventually reach the Fannaraken mountain hut, at 2068m the highest hut in Norway. From Fannaraken, it is only another 8 or 9km to Turtagro. The initial part of this final section entails a steep descent. Once you hit the valley floor it is easy walking the rest of the way to Turtagro. Mountain huts and lodges are available, but tend to be expensive. Camping is possible anywhere in the park, as long as you are at least 150m away from the nearest hut or lodge. I recommend bringing your own shelter. 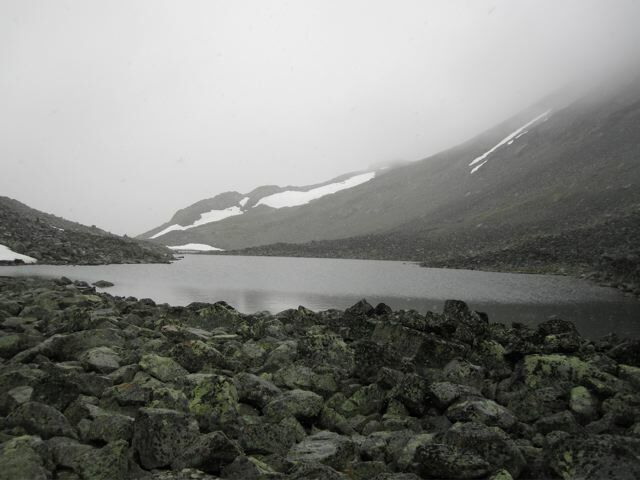 Jotunheimen is too beautiful a place to be stuck inside. Note that if it is absolutely bucketing down for three days straight, with white-out conditions thrown in, the lodges may begin to look pretty good. Wow. 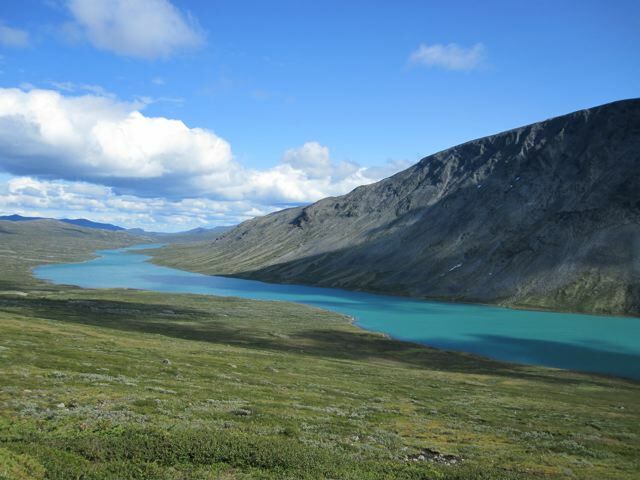 Justifiably Norway’s most popular national park. Like walking in a wilderness postcard. 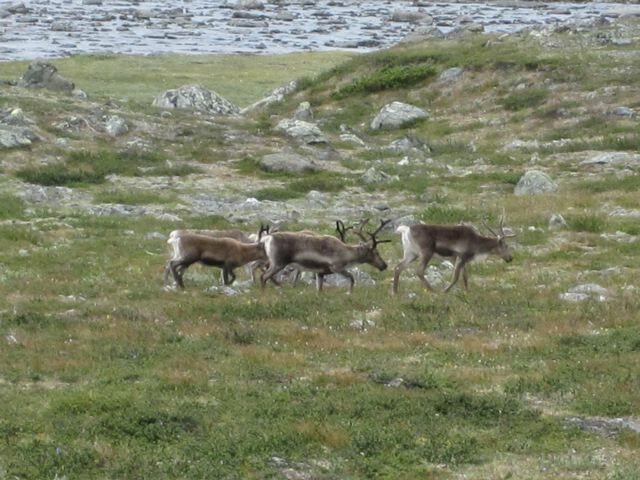 Once you are past the Besseggen ridge, the crowds thin out dramatically. Good luck with the weather.